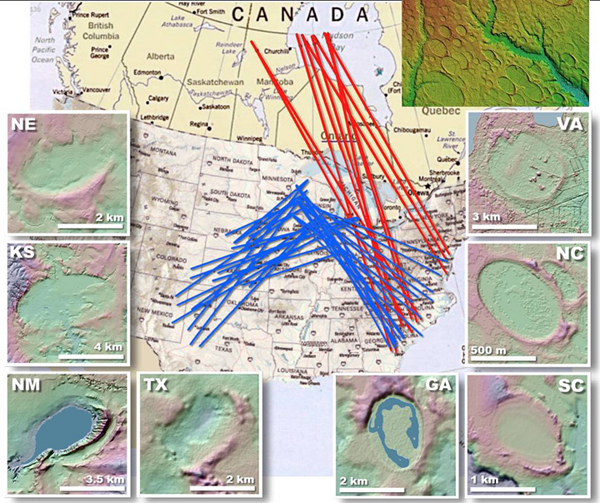 Extraterrestrial Impact Event: Mammoth, Megafauna and the Clovis Extinction, 12,000 Years Ago. Why is it excellent? Because perhaps it will inspire people to take this phenomena a little more seriously. For instance, those who oppose an extra-terrestrial formation hypothesis for Carolina Bay formation rarely recognize their ubiquity on the landscape. In fact, it is repeatedly claimed by otherwise competent earth scientists that bays exist only on the NA Coastal Plain. Not only are they found in the Piedmont — they are are found nearly a thousand miles inland. I plan to put up dozens more examples like this of the “Carolina” Bays ET or not — there is a lot more to these features than is generally acknowledged.